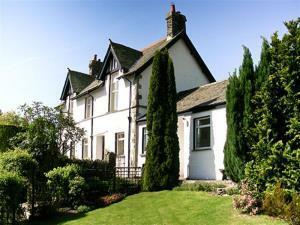 Stamp Howe Self-cateringStamp Howe is a spacious, detached country house with a lovely holiday atmosphere, in the delightful village of Troutbeck high in the Kirkstone hills above Ambleside. This is one of Lakeland's most picturesque villages noted for its character buildings of local stone, many of which are of historic interest. Stamp Howe is unusually named being on the site of the original 'stamping' ground and barn where horses were rested during coaching days. There are challenging walks from the door to Wansfell and Ill Bell and country rambles for those who wish to take it easy. The famous Mortal Man, an old coaching inn, is a short stroll away and is an excellent place for an evening meal. The Queen's Head is also within walking distance being at the other side of the village. Accommodation: There is an entrance hall, well-equipped fitted kitchen and separate dining room. There are two ground floor sitting rooms - the main lounge is on the corner of the house (flat screen TV with freesat HD, DVD player, electric fire), whilst the smaller sitting room would be ideal for quiet reading or planning your next busy day. Also on the ground floor is a family room with an adult Bar Billiards table and hi-fi with radio/CD and Ipod docking station. Ground floor bathroom has bath with shower over, basin and wc. Useful drying area. Upstairs are four good bedrooms - two doubles both with king-sized beds - and two twins. Three of the rooms have wash basins. Bathroom with shower, basin and wc. Separate wc. All the front rooms have lovely views to distant hills. Furnishings throughout are very comfortable with co-ordinated colours and good fabrics. Fitted carpets. Outside: Ample parking for two or three cars. Large garden with lawns, steps and paths with trees and shrubs. Sitting out area with garden furniture provided. Sorry no pets * non-smoking * duvets/beds made up for arrival * oil fired central heating * dishwasher * auto washer/dryer * microwave * fridge and freezer * electric cooker * free wireless broadband * payphone * travel cot and high chair available - please order * towels available - please order * village store/post office half a mile approx. Stamp Howe is a spacious, detached country house with a lovely holiday atmosphere, in the delightful village of Troutbeck high in the Kirkstone hills above Ambleside.